Pour red wine vinegar over onion in a bowl, cover and let sit for ½ hour (good for up to one month after marinated). Toss ½ inch tilapia strips with the ancho powder, jalapeños, ½ of the cilantro and vegetable oil. Marinate for ½ hour. Mix together the ingredients for the crema. 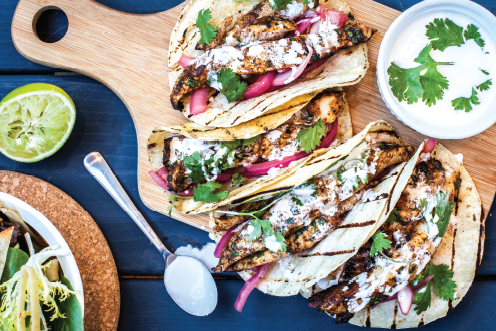 Grill tilapia and tortillas, fill grilled tortilla with tilapia and marinated onions, top with chopped cilantro and crema. Makes 12 tacos – enjoy!